A gastric ulcer is a sore in the lining of the stomach. Gastric ulcers do not always cause symptoms. Symptoms may come and go. Food or fluids sometimes make symptoms better. Having an empty stomach may make symptoms worse. However, symptoms can occur at any time. 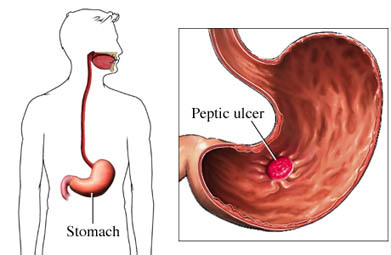 A perforated ulcer is a break through the wall of the stomach. It causes sudden and severe pain. Avoid NSAIDs. This includes common over-the-counter drugs like aspirin and ibuprofen . An upper GI endoscopy may be done to stop bleeding. A thin, lighted tube is inserted down the throat into the stomach or intestine. Heat, electricity, medicine, or a special glue will be applied to the area. This should stop the blood flow. Ask your doctor if there is an alternative treatment. Talk to your doctor about taking other medicines to protect your stomach and intestines.